Numbingly tragic is how wildlife vet Dr William Fowlds describes what he had to recount in a long-running trial that on Friday 15 March saw three men convicted for 10 rhino-poaching incidents around Makhanda (Grahamstown) as well as Jansenville, Cradock and Graaff-Reinet. However, like Tourism and Environment MEC Oscar Mabuyane and Eastern Cape Parks and Tourism CEO Vuyani Dayimani, he believes the judgment is a victory for the sector.and sends a strong message to would-be poachers that this province is no soft target. Judge Jeremy Pickering found Jabulani Ndlovu and Sibusiso Ndlovu guilty on 55 counts in 10 rhino poaching incidents. Forget Ndlovu was found guilty of 50 counts in nine of those. Charges relating to three other poaching incidents (two at Pumba reserve and one at Sibuya) were separated early in the trial. During the Ndlovus’ three-year poaching spree, at least 10 rhinos died and 17 rhino horns were removed. Two dramatic events were included in the evidence heard in the High Court in Makhanda (Grahamstown). The first was early in 2016 on Kleindoornberg game farm near Cradock, where staff member Honesty Mwariwanga assisted Jabulani and Sibusiso in their night-time poaching venture on 27-28 January. Mwariwanga was gored by a black rhino and had to be rushed to hospital. Mwariwanga subsequently made a statement implicating the men in this attempted poaching incident, as well as incidents at two other Cradock farms owned by his employer, Erwin Tam. 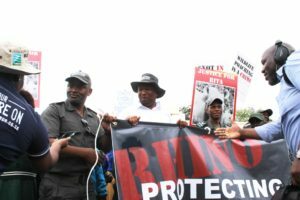 Apart from the inside knowledge sometimes provided by people such as Mwariwanga, the men’s poaching ventures were often preceded a few months earlier by reconaissance visits to the reserves. The second event that caught the public’s attention was the Ndlovus’ dramatic arrest at Makana Resort outside Makhanda in June 2016. Seized from their chalet were a freshly cut rhino horn along with tranquilliser, a dart gun, a saw and a knife. They were apprehended as part of the South African Police Service’s Operation Full Moon hours after the killing and removal of the horn of a white rhino at Bucklands Reserve outside Makhanda. Evidence in the trial was extensive and detailed. Police forensic testing matched DNA from the Bucklands rhino, Campbell, to that found on the saw. 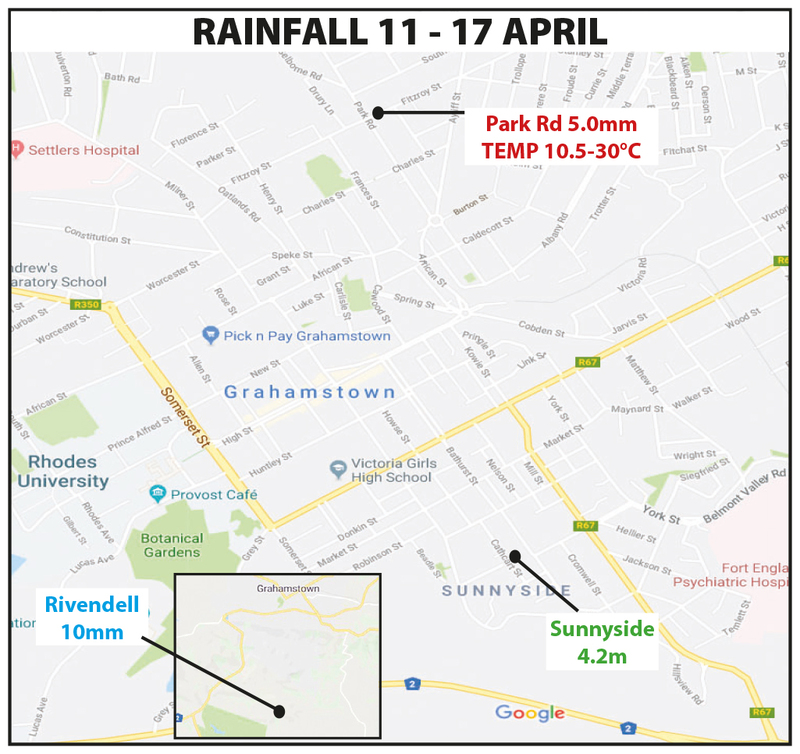 A forensic paint specialist, flown in from Pretoria at the insistence of the defence, matched a paint chip found at the scene of the Bucklands incident to a gap in the paint on the saw. Captain Deon Viljoen, commander of the Jeffrey’s Bay Stock Theft and Endangered Species Unit and Provincial Co-ordinator for Rhino Poaching Investigations, was intensively cross-questioned about Operation Full Moon and the Makana Resort arrests in a trial-within-a-trial. In this, the Judge ruled that it was in the interests of justice that the evidence seized at Makana Resort was admissible, despite various procedural irregularities by the police. A ballistics specialist spoke in detail about the dart guns used, and how the darts found at poaching scenes could be linked to them. However, most of the evidence was centred on linking detailed cellphone records with GPS tracking and car-hire documentation, and establishing a pattern of night-time driving and cellphone activity that corresponded with the times and locations of poaching incidents. It was these linkages that the defence vigorously challenged in their closing arguments. 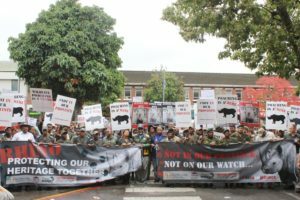 The modus operandi of the men, in general, was to convene in Port Elizabeth, drive to accommodation near the poaching site, from where two of them would be dropped to hunt the rhino and remove the horn. They’d phone the third member, who would come and fetch them. A flight from PE, then a hired car from the airport in Joburg to the Bruma Lake area would follow. Viljoen testified during the trial that many syndicates selling illegal goods to Asian countries were known to operate from various premises in Bruma Lake. But of all the evidence recounted in Judge Pickering’s judgment, it was the details of what the rhinos underwent in the various incidents, as decribed by Fowlds, that was the most gruelling. Some of these details are contained in the shaded box below. NOTE: The descriptions in ‘The Death of a Rhino’ are upsetting. Speaking to Grocott’s Mail hours after the conviction, Fowlds said the judgment showed the enormous amount of work from a range of disciplines that had gone into investigating the poaching incidents. “Reading the judgment in detail shows how organised and complicated these crimes are,” Fowlds said. The ground-breaking aspect of Friday’s judgment, he said, was the way in which microscopic details, including ballistic evidence matching dart guns and saws with crime scenes, contributed to the conviction. Also ground-breaking, Fowlds said, was the use of complex cellphone records to associate a cellphone user with an event. “These two areas will definitely make a difference to the way prosecutors tackle future cases,” said Fowlds, who had high praise for reserve staff. “Private and government reserves did really good work in collecting and collating evidence and establishing exactly what happened across this very varied landscape of the crime scenes,” Fowlds said. “Getting all that together was a phenomenal effort. “This judgment sends out a strong message to would-be poachers that we are not a soft target – that this is a stronghold against poaching. There were extraordinary people involved in this case whose passion goes well beyond their job descriptions,” Fowlds said. 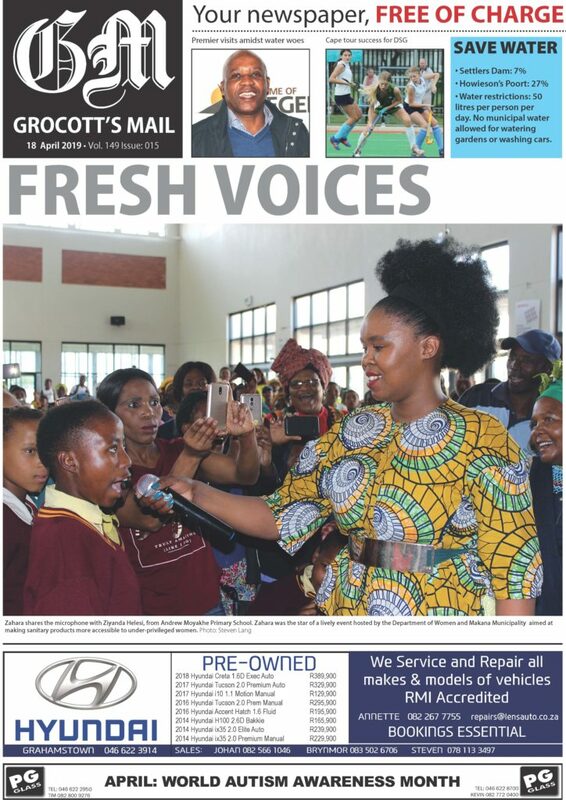 His view was backed up by Eastern Cape Parks and Tourism Agency CEO Vuyani Dayimani. Commenting to Grocott’s Mail in an emailed reply, Dayimani said, “I think it’s good work all round… years of patient work from all those involved, from the rangers to the law-enforcement agencies. I thank them for their commitment and dedication towards following all the relevant steps to achieve this welcome news. “It is a victory for the sector. For those who have sacrificed their time protecting our wildlife, this is welcome news,” Dayimani said. Mabuyane appealed to communities in villages next to wild life parks not to accommodate strangers in their homes. “Some of the poachers use rural villages neighboring parks as a base for planning poaching,” Mabuyane said. He said the Province was investing R15 million to improve the security capabilities of the parks under the ownership of the provincial government. Judge Pickering found Jabulani Ndlovu and Sibusiso Ndlovu guilty on 55 counts in 10 rhino poaching incidents. In the Kleindoringberg incident, they were guilty of attempted theft of the rhino horn rather than theft. Forget Ndlovu was found guilty of 50 counts in nine of those incidents. He was found not guilty of the five counts relating to the Kleindoringberg incident, where Honesty Mwariwanga was the third accomplice. Argument on sentencing was heard on Monday 18 March and sentencing will be on 3 April. 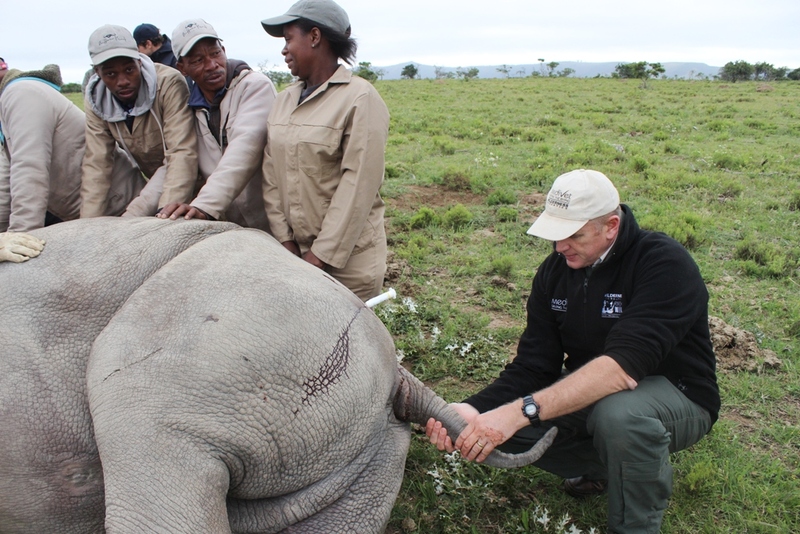 On 3 March 2015, Fowlds performed a post-mortem on a female white rhino and her sub-adult calf. “The adult rhino was found on her chest wither head elevated on a branch, both horns removed… with a saw with a serrated edge. The rhino was heavily pregnant. The sub-adult rhino was lying on its side with a stone under its head. Its front horn had been removed with a saw with a serrated edge. At Bucklands near Makhanda, the rhino bull Campbell was darted and dehorned on 17-18 June 2016. “The bull was lying [on his right side]in a large pool of blood and blood-tainted foam with the front horn missing. The blood emanated from the traumatised sinuses and airways which has been traumatically exposed when the horn was removed. Pickering recounts the KIeindoringberg (Cradock) incident in his judgment. A rhino carcass was found in the veld on the morning of 1 February 2016 with bothhorns still present. State vet Dr Malan, had performed the post-mortem and discovered this, as well as a dart left in the rhino’s skin. Owner Erwin Tam in evidence later said he and his father were out of the country and had left the staff in charge of the farm. Tam was told about the white rhino being killed, but its horn left. Employee Honesty Mwariwanga, in a statement to Viljoen, had admitted to his involvement and explained why the horn had been relinquished. Mwariwanga had been paid R35 000 in cash for his services. Contravention of Section 90 of the Firearms Control Act 60 of 2000 and Section 250 of the Criminal Procedure Act, 51 of 1977 (unlawful possession of ammunition). 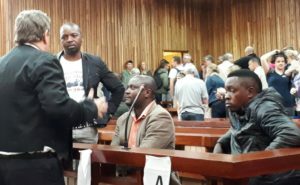 Jabulani Ndlovu and Sibusiso Ndlovu (Accused 1 and 3) faced and were found guilty of 55 counts in the 10 incidents dealt with in this trial. Forget (Accused #2) was convicted of 50 counts in nine of them.